The Specialty Equipment Market Association, or SEMA, was formed back in 1963 as an automotive aftermarket group. Today, the SEMA group consists of over 6,000 different companies from around the world. Comprised of aftermarket manufacturers, car dealers, installers, specialty equipment distributors, and original equipment manufacturers, SEMA is the most respected organization when it comes to the automotive aftermarket. Every year, the group hosts a show at the Las Vegas Convention Center that draws a crowd of more than 60,000 buyers from around the world. Aside from global auto shows, the SEMA Show is the largest stage for automotive manufacturers to introduce their newest concepts and show off their most creative side. While these concepts won’t be making their way to a Chevy dealer near Lisle or anywhere else in the United States anytime soon, they are certainly fun to check out. Chevrolet is celebrating a few important milestones this year, and the bowtie brand chose the SEMA Show stage to help highlight its impressive achievements. The American car brand always makes it a point to go all out for the annual SEMA Show in Las Vegas, and this year was no exception. Check out all that the brand has on display this year, and see why this Chevy dealer near Lisle is exceptionally jealous not to be in attendance. Alas, we will just have to settle for exploring these fun concepts from afar, and keep our fingers crossed that they gain enough traction to one day make it on showroom floors of Chevy dealers across the nation. The name of this Camaro concept says it all. Slamming onto the scene in a big way, this Camaro concept is meant to highlight the iconic pony car’s 50th anniversary – a milestone the popular coupe is celebrating this year. Chevrolet spared no expense or frills for the unveiling of the Camaro SS Slammer concept at the SEMA Show this week, which was introduced by none other than Dale Earnhardt Jr. It only makes sense that one of the most popular names in auto racing would reveal one of the most performance-enhanced sports cars ever made, and the crowd was more than pleased with Chevy’s choice. 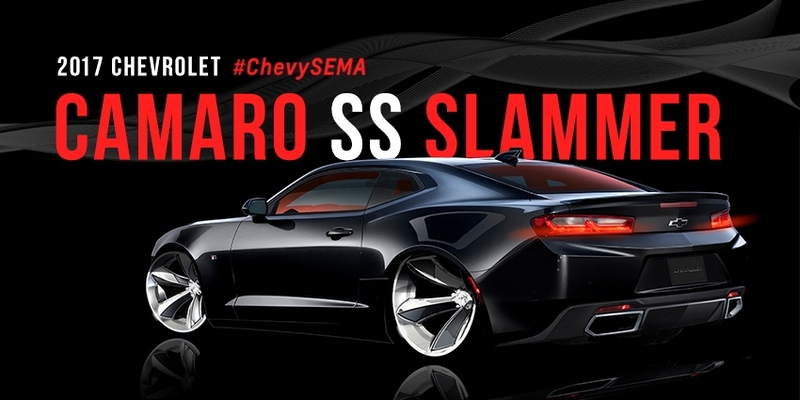 The 2017 Camaro SS Slammer is a lowered version of the sports coupe, and was modified by Chevrolet engineers to feature front 22-inch wheels, and rear 24-inch wheels. To further enhance the Camaro concept’s first impression, the iconic car was lowered even further with the deflation of air shocks when placed in the park position. John Cafaro, Global Design Executive Director for Chevrolet, was responsible for creating the SS Slammer concept. At the newest Camaro’s reveal on November 1, Cafaro said, “The Camaro SS Slammer concept is a design exercise intended to take the Gen 6 Camaro’s proportions to the extreme.” From where this Chevy dealer stands, it seems that the brand succeeded in achieving their desired intention – and then some. The special edition 2017 Camaro SS Slammer concept features sleek black exterior paint, accented with gloss-white flakes meant to support a subtle sparkle and add depth. Sitting underneath the custom engine cover on the front hood of the SS Slammer, is a performance-enhanced 455-horsepower LT1 engine, paired with a six-speed manual transmission with Active Rev Match. Not only does this Camaro concept show well, it performs above and beyond all expectations. As if the Camaro SS Slammer concept wasn’t enough to acknowledge the nameplate’s 50th anniversary, Chevrolet went ahead and created the Camaro Turbo AutoX for good measure. Named after the parking-lot motorsport of autocross (yes, that’s a thing), the Camaro Turbo AutoX concept is less expensive, and features a 2.0-liter engine with upgraded brakes, exhaust, and suspension. Also sporting a performance-enhanced lowering kit, this particular Camaro model sits three-quarters of an inch lower than the standard version of the sports car. Larger stabilizer bars, and a stiffer strut tower brace and suspension links, makes this concept the perfect companion for any parking-lot motorsport enthusiast. Complemented with 20-inch wheels that were conceptualized specifically for the Camaro Turbo AutoX model, this coupe rounds out its impressive performance upgrades with a six-piston brake setup, slotted rotors, and a Chevy Performance exhaust system. Easily the only sports car made for parking lot performance, the Camaro Turbo AutoX is unlike anything this Chevy dealer has ever seen. Just as unique as its intended purpose, is its exterior Shock Yellow color, accented with pearl nickel and carbon flash metallic striping. A useful tow hook is prominently displayed under the front bumper of the Turbo AutoX model, while a GoPro camera mount is perfectly situated to capture every adrenaline-inducing moment of the sport. These minor finishing touches serve as a reminder that the Camaro Turbo AutoX was created for a very unique and specific purpose. While we aren’t going to have either of these unique Camaro models on our showroom floor here at Chevrolet of Naperville, we do have a great inventory of new Camaro models ready for you to take for a test drive. As the number one rated Chevy dealer near Lisle, Chevrolet of Naperville is the destination for buyers seeking out a performance-ready Camaro to take home and call their very own. Be sure to stop by our convenient location in Naperville off Ogden Road just east of Route 59, and five minutes south of I-88. Our friendly team is ready and waiting to show you all that the 2017 Chevrolet lineup has to offer – and believe us, you don’t want to miss out on this incredible model year for the iconic bowtie brand. Rather than go through the tedious task of sorting through the list of Chevy dealers near Lisle, make Chevrolet of Naperville the first stop on your journey to new car ownership. Our customer-focused approach to car sales will leave you feeling confident, happy, and secure in your new vehicle purchase. We hope to see you down at Chevrolet of Naperville, very soon.